What does the public expect from foot patrol? 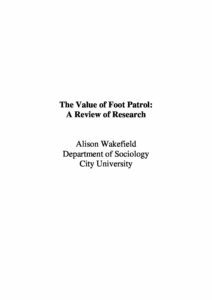 What models of foot patrol can be identified from the research evidence? What should be the main objectives of foot patrol, based on public expectations? Are these objectives being achieved? PEEL Effectiveness and neighbourhood policing: Tugging at the bed-sheet?